It is a truth universally acknowledged that a man in need of a good lunch could do far worse than being fed by Fergus Henderson. It’s also a great deal more exciting to read a slating than a rave, so you may be disappointed by this in a manner I wholly wasn’t by an unplanned trip to East London. As someone who occasionally auditions unsuccessfully for the opportunity to flog unwanted items to an unsuspecting public, I found myself in Hoxton attempting to convince a bunch of aging creatives I could take their YouTube video viral in a manner totally at odds with the size of fee on offer. I was ushered into offices that would have been open plan, were it not for enormous rounded Perspex screens that resembled Kubrick’s vision of the future circa1965. These are presumably vital for keeping app developers and cereal influencers separate and preventing artificial turf wars breaking out across the floor. However, it did make for an odd environment in which to be filmed pretending to be covered in food from a faulty food blender which did not exist. As anyone who has been through the ridiculous process of attempting to appear in adverts will tell you, the one thing you invariably leave at the door is your dignity, which is made even more agonizing when you have a personal shopper and a Bitcoin entrepreneur staring at you quizzically through the walls of their adjacent pods. Having sold my soul (very cheaply,) I bid farewell to my perfectly amenable tormentors, certain I had failed to convince them of their fictional blender or my air-driving skills, mainly because I had failed to convince myself of them either. Nonetheless, I departed with a spring in my step, partly because my ordeal was over, but also on account of the weather, which seemed to be putting on a much better show than I had just managed. I ambled towards Spitalfields with lunch on my mind, and no particular plan of how to achieve it. Crossing Brick Lane is often said by those in the know to be the best way to avoid disappointment, which is perhaps a little unfair, especially if what you’re after is a bagel, but in retrospect, I think I knew where I was going. I’d like to pretend my life is a bohemian whirl of chance discoveries, but for most of us, when it comes to lunch, there is little that recommends itself like certainty. Unsurprisingly enough, I found myself in front of St John Bread and Wine and did what any sane person would do. I went inside. Like its slightly better known sibling up the road, there is something enormously comforting in the unfussy minimalism within. A more waspish diner might throw the words ‘Victorian workhouse’ at the décor, but between the wooden tables and chairs, the blackboards and the glimpse of a kitchen that is clearly a place to work rather than show off, there is a simple utilitarian aesthetic at work. This also translates into an easy confidence on the part of the staff. They know they do what they do very well, and they invite you to share in it with them. If you are not impressed by St John, that is your loss, not theirs. 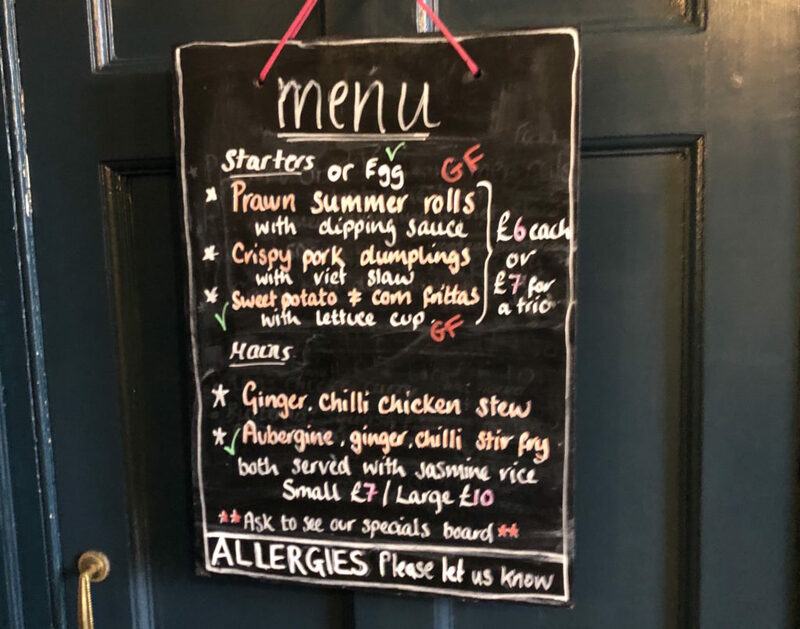 A simple A4 sheet lists the dishes on offer, with a few specials chalked up on the blackboard. These are not all ingredients you would expect to find on every menu, but they are of a part with the quiet revolution in British cooking Mr Henderson has presided over for the last couple of decades. As such, it would have been remiss not to begin with the dish that best encapsulates that ethos, the effectively holy roast bone marrow on toast. The late Anthony Bourdain described it, unimprovably, as ‘God’s Butter.’ Nonetheless, when dealing with food this famous, one is always tempted to see if the fuss is still justified. The answer is yes, it is. I had almost prepared myself for disappointment, until the crisp of the thinly sliced sourdough toast was dampened with the comforting richness of the marrow and perked back up with the zing of caper, parsley and onion, and that sense of magic filled both mouth and brain. It made me very happy, and you can’t ask for much more from a plate of food. There was the usual exceptional selection of wines by the bottle and glass, but unfortunately I needed my wits about me later in the afternoon, which is the only area where lunch veered away from the sublime. This did at least allow me to concentrate on the food. 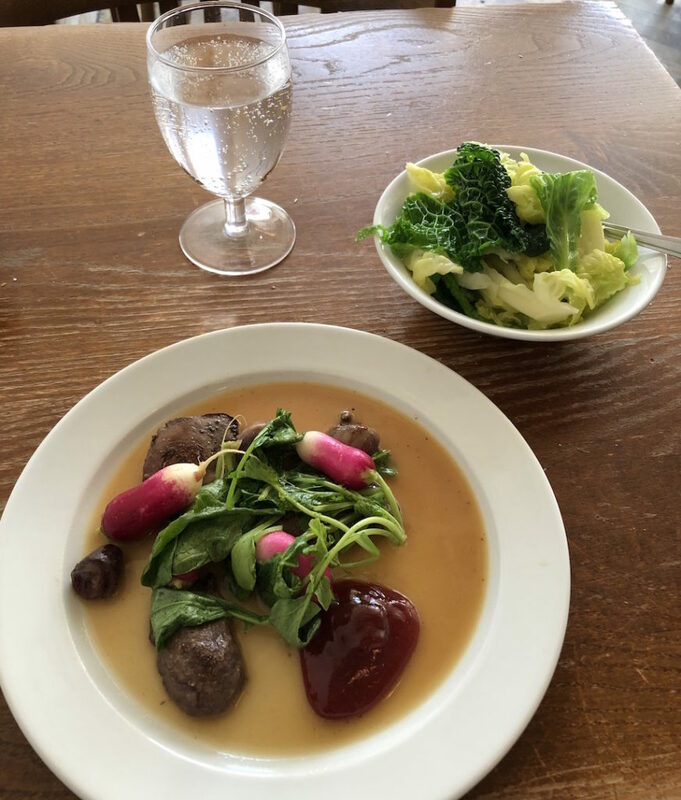 My main course was a special of rabbit offal with radishes and a quince jelly that appeared determined to ask redcurrants outside for a fight, and then leave them there looking foolish. Radish tops made excellent mops for soaking up a delicate sauce made with sherry vinegar and chicken stock – I also ordered some greens, and was about to get a little grumpy at cabbage costing £5.20 until I tasted it and then I just wasn’t. I also wondered about portion size, but the combination of the rich, iron packed offal, the sweetness of the jelly and the soothing qualities of the sauce all worked so beautifully together, I finally understood why the phrase ‘an elegant sufficiency’ was invented. The main reason it was invented was, of course, to leave room for dessert. Having recently forsworn chocolate as part of an innovative ‘fitting into some of my trousers’ regime, I had made it to April in slightly better fettle than I had approached January. As such, I was in the mood to reward myself. My wife replied to the picture I posted of my lunch online with the suitably tart, “Is that pudding simply a slab of chocolate?” to which I responded with, “It is a chocolate terrine with a brandied prune. So basically yes. With a brandied prune.” I may not have been drinking but there is certainly no law against sherry sauces or fruit pickled in the finest sense of the word. This was pure, decadent indulgence, and if anything made me grin more widely than my starter, which can’t have been a pretty sight. This was not an everyday meal, even if an unshowy restaurant selling sourdough and Eccles cakes across the counter made it almost feel like one. Which is really St John’s greatest triumph – they make the wonderful almost mundane, were that not to damn them with faint praise. It is not every day I spend almost fifty quid on lunch, and if it was, I’m pretty sure it would not be long before I would have to start searching for a new wife, without the good fortune which is, according to Jane Austen, a fundamental requirement of finding one. It is probably best at this point I resist the temptation to mangle her words any further. She doesn’t deserve it and anyway, you shouldn’t mess with perfection. As St John Bread and Wine understand. Perfectly. Well, this is tedious. In Nottingham for the weekend playing the excellent Glee Club. Despite having attempted to check into the Jury’s Inn they used to book us into, (and having paid to use their car park) it turned out I was actually in another hotel nearer to the gig but further away from my car. After a smashing show on Friday night, the next morning I went for a stupidly long run having not had any breakfast, thinking I would treat myself to a Nando’s protein and vegetable blowout for lunch, as that is often my fallback failsafe eating option when on the road. None of this was the tedious bit, even if it reads like it. What happened next was – I Googled ‘restaurants near me’ on the off chance there was something more exciting than Peri Peri chicken to be had nearby, and came up with Hart’s, approximately 100 yards from my hotel. I walked up there and was sat at a table within minutes, had an excellent lunch and then walked back to my hotel. Absolutely nothing else to report, which I think we can all agree, in blogging terms, is tremendously dull. What arrived was, in the words of The Cure, simply elegant. I decided on a butternut squash soup as I wasn’t in the mood for goat’s cheese and I didn’t know what a crottin was, although I bet it’s like fried toast. I’m very glad I did. This was exquisite – silky, smooth, almost sweet with a little slick of oil through it and a slight bite from chopped chives. Genuinely one of the best soups I’ve ever had, mainly because I rarely order soup in a restaurant as it’s generally not as exciting as the other things on the menu. Thanks to some rather nice sourdough, this plate went back to the kitchen cleaner than it was before they put soup in it. Artfully arranged, a plate of perfectly cooked, crispy skinned cod was a delight, translucent flakes resting (as you do) on a bed of diced chorizo and leeks, with a delightfully truffled cauliflower puree whose only fault was there wasn’t quite enough of it for my ‘taste’, by which I mean ‘greed’. I’ve been off sugar since the start of the year, so when I have some, it is a genuine treat, and a yoghurt and lemon parfait with poached rhubarb was superb, especially with an added quenelle of unadvertised rhubarb ice cream. This was already doing a heavenly little dance on the taste buds, but a scattering of candied hazelnuts added further texture (SUGAR!!!) and what can only bedescribed as an all singing, high kicking chorus. Rarely have I eaten three plates of food one after the other that have better fulfilled their job descriptions: starter, main, dessert. Bish, bash, bosh. Done. Simple perfection. Service was efficient, friendly, and while there may have been a slightly longer wait for a couple of dishes than I might have liked, that is only to be expected from a busy kitchen turning out dishes of this quality. With a bottle of sparkling water and a tip, the bill came in at £30 for a really rather memorable lunch. Rather unexcitingly, I had absolutely no complaints whatsoever, and walked back to the hotel in a fabulous mood. Luckily the England rugby team soon put paid to that by getting stuffed in Cardiff against all expectations, and nothing is more tedious than that. I was very tempted to go back to Hart’s for dinner just to cheer myself up again. I hate horror movies. I just don’t particularly like the sensation of being scared, weirdly. That is why Hal Cruttenden took me to watch Halloween 2 as part of an idea we had for a podcast, which presently consists of two middle-aged men bitching at each other for six hours in search of an editor. The Barnet Everyman is a cracking cinema – a tastefully decorated art deco number with enthusiastic staff and a lovely vibe throughout. Hal bought us a couple of excellent burgers at Spielburger on our huge expense account beforehand, and then we headed to the auditorium. To our surprise, we were enthusiastically greeted at the entrance by a man with an extravagant moustache bellowing ‘I told her I first saw this TWENTY YEARS AGO and she had NO IDEA WHAT I MEANT!! !’ at us. Being English cowards, we both nodded politely, walked round him and sat on our comfortable sofa before turning to each other to question what we’d just seen. We soon found out, because our moustachioed friend added greatly to the atmosphere with helpful comments from the back like, ‘Well THAT wasn’t very nice!’ as Michael Myers sprayed gore across the screen. Nothing ruins the tension of a decent piece of cinema like a bellend commentating on it, and this was brought to something of a head when he strolled down to the front row (with his bottle of wine,) sat down and addressed a few more well chosen remarks to the screen. Eventually, some poor, hapless, (and considerably braver than us) teenager was dispatched by the management to ask him to vacate the room, at which point he stood up, declared us all to be ‘C*NTS’ and swept out with an enormous amount of dignity for someone who didn’t appear to have any. The upshot of this is we were offered free tickets to a future Everyman screening as recompense for the extra entertainment, and being a generous soul, Hal gave me his. I took advantage of these on a rare date night last week to take my wife to see ‘The Favourite’ which was very good, although not quite as good as it thinks it is. I mean, if you can’t win an Oscar for playing a gout-ridden, bulimic, lesbian monarch who has a stroke in the final act, you probably shouldn’t be allowed in movies anyway. I could have won an Oscar doing that. But that is not why we’re here. I’m on a bit of a January health kick/detox/Christmas cheese belly removal program at the moment, so I had essentially starved myself all day in the expectation of another Spielburger, and we arrived with plenty of time to sit down in the ‘distressed diner’ surrounds of this rather good little burger joint attached to the foyer. I was going to have the ‘House’ burger I had last time – basically a good old fashioned cheeseburger with lettuce and tomato and a choice of cheeses and/or bacon. Having ordered blue cheese, the waiter mentioned a special version with French mustard and onion chutney, so I went for that with sweet potato fries, while my wife had the House with gruyere and regular fries. The menu is pretty sparse otherwise, but I did notice some padron peppers while we were waiting and added these to our order. Everything was excellent. Succulent, tasty burgers, although I wish I’d had the House, or someone had stuck some lettuce and a slice of tomato on my special. 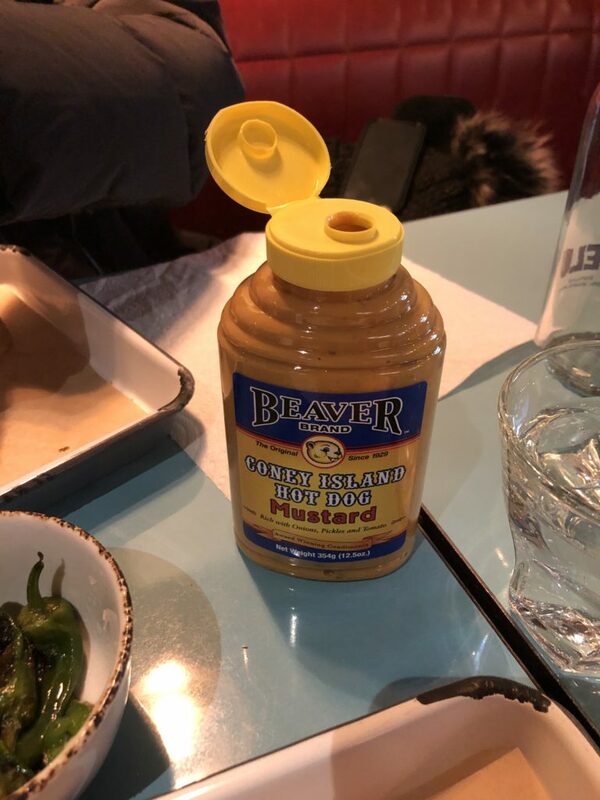 They also had jars of Beaver Coney Island Hot Dog Mustard which seems to be a kind of American Piccalilli I advise you to go out and buy immediately. The fries were exemplary, especially the sweet potato version in their salty, crispy skins and the peppers were faultless, even if you do have to be going some to screw them up. They were, however, served in a cup and there were maybe ten of them. I have a pack from Sainsbury’s in my fridge – there are fifteen and they cost £1. The Spielburger Ten (two more than The Hateful Eight, two less than The Dirty Dozen,) were £5.50. We also had a bottle of mineral water each, and the bill for our meal came to £35. That is quite a sum I’d not quite realized Hal had spent on me. I must remember to thank him, and possibly not complain so much about having to spend a similar amount on my wife. BUT – that is A LOT of money for two burgers and fries. Yes, they were very good, but I’m not sure any burger is that good. For years I have been annoyed by the mark up on food at cinemas and the ridiculous deals involving vats of popcorn and litres of sugary drinks, and I know it’s really where they make their profits, but this does seem excessive, even for much better food. I’m just really glad we didn’t have to pay for the film, otherwise, with babysitter, a Tuesday night at the pictures for two would have cost £90. Plus petrol. That. Is. Mental. I love Everyman. I love the way they look, the way they present the films, the sofas, the fact you can take a drink or even food into the auditorium, the enthusiasm of the staff etc etc. But I’m sorry to say, next time, I probably won’t go the extra mile to Barnet. I’ll do the classic Hatfield Odeon/Nando’s run and still have change out of £60. I can’t blame Everyman for the cost of the babysitter, and I can’t really fault Spielburger for the quality of the burgers. I’ll just have to make sure every time I go there from now on, Hal Cruttenden buys dinner and there’s a nutter in the auditorium as well as pricing the menu. And with prices like these, who needs horror movies? The Sunday lunch is a venerable institution for very good reasons. Really, it should be simplicity itself, but it is not always so. We have all sat around cold plates of shoe leather in brown water, presumably left over from cooking the vegetables over (several) nights, which does at least soften the accompanying pucks of hardened batter in a futile attempt to make them more pudding, less Yorkshire. However, as the UK continues its journey away from international culinary laughing stock to experiment with more complex and divisive reasons for the rest of the world to dismiss as peculiar self-harmers, the dreadful Sunday roast has, thankfully, become that much harder to find. I make a good one. My wife makes a better one, much as it pains me to say so. What I think everyone can agree on is finding a pub near you that does a really good one is a discovery to be cherished, and once you have done so, that pub is likely to be the beneficiary of your custom for years to come. I could wax lyrical here about any number of regular haunts over the years, but we all have our own, so, as a generous soul (but particularly lazy writer,) I’d like to invite you to take a moment to remember some of yours. I think I may have found the latest incumbent of the hallowed title of ‘Alistair’s local’. We’ve been to The College Arms about four or five times now, and it has only varied in standard from the very good to the absolutely excellent. We’ve even taken my parents there and they are the KISS OF DEATH to any establishment, as I think I may have mentioned previously. Since getting married, moving out of London and becoming a dad, the biggest change to my Sunday lunches is they tend to involve more people and I don’t get to read the paper any more. Oh, and a bit more food ends up on the floor, which means the dog is happier too. My brother-in-law was staying with us, so we made a last minute decision to book and thankfully they found space. There is a restaurant if you call a little earlier and are not well disposed towards our four legged friends, in which case I don’t particularly want to sit next to you either. As it was, we found ourselves neatly tucked away with a high chair in a corner of the snug next to another family with a baby and a dog, like the sort of advert that makes you throw things at the telly. There is a decent a la carte of relatively typical gastropub staples, but with a couple of dishes that hint at more ambition – a beetroot and butterbean slider, or a Catalanfish stew – but I have no problem with staples. These dishes are there because done well, they taste really good, which is exactly how The College Arms does them. We didn’t even have starters, but went straight for mains. My wife and her brother both had roast lamb, which was just about as spot-on as a Roast Lamb Sunday Lunch could be – perfectly cooked, moist and tasty meat in generous portions with the sort of Yorkshires my wife can make and I can’t (an extra one is another 50p, so they even have their own price tag.) What really elevated the whole experience though, was the perfect vegetables. It’s so easy to get bits of a roast wrong and they just don’t. I, naturally, went a bit more poncey and ordered the guinea fowl because we have history. About a decade ago, I lived with a dear friend, comedian and filmmaker, Barry Castagnola, who very kindly put me up in his flat when I was very much in need of being put up with. Early in my stay he told me about the local pub and the fact they did a good burger. When I came back he asked how it was, I airily said ‘Oh, I had the guinea fowl’ and he has not let me forget it ever since. This one was served as a supreme with crispy skin in a red wine jus, on a bed of kale with wild mushroom sauté potatoes and was every bit as epic as that sounds. I even splashed out on a Yorkshire pudding as it didn’t come with one (sacrilege!) and sent Barry a picture. Obviously dessert was a requirement after this, and once again the kitchen proved that a little care goes a long way. My brother-in-law had an excellent chocolate tart that I would like to tell you more about but he was only handing out pieces too small for anyone else to taste. A square of bread and butter pudding with apricots running through it and sat in a large pool of custard might as well have had ‘comfort’ tattooed across its knuckles. I was left with a slightly deconstructed apple and rhubarb cheesecake. Now, in my book, a cheesecake needs a base – this had a ginger ‘crumb’ casually tossed across it. If I was being ultra picky I would suggest this left it as more of a splodge than a slice, but as I ate it, I (almost) became converted. Small blobs of rhubarb jam gave the cream cheese something to work with, and wafer thin slices of dried apple gave it further acidity and the textural contrast the crumb was trying to achieve. It was delicious, even if I thought it wasn’t at first, and that is quite a feat. Service was exemplary throughout. Well, they forgot a pint of lime and soda, but I almost hope that was just to remind us how little else they got wrong. £80 for three and a half of us, including service, seemed a fair price for a truly lovely meal. If you are looking for the perfect Sunday lunch, I would recommend The College Arms unreservedly, but I won’t, because I still want to be able to get a reservation. If anything, comedians hate Christmas more than turkeys, mainly because turkeys can only die once. There are benefits to performing in rooms full of office parties, fuelled by 364 days of workplace frustration, a nagging sensation they wouldn’t socialize with the majority of their tablemates during nuclear fallout, a fundamental dislike of live comedy and inordinate quantities of expensive cheap wine, but last Friday night in Bath I was struggling to remember them from the stage. Admittedly, I’ve had worse. At this time of year the real benefits occur offstage, including, on this occasion, the opportunity to spend three days getting paid to live in the city where I went to school. This also meant the chance to spend time with old friends. I was delighted to be performing with Laura Lexx, who provided a masterclass in how to MC rooms full of what our other colleague, the brilliant Mark Nelson, described to me in a Facebook message after Saturday’s gig as ‘C****NNNNTTTTSSSS.’ I also got to have lunch with Mark at Corkage on Walcot St, a small plates restaurant with a stunning wine list we were unable to take advantage of (much to the waiter’s distress,) due to the need to not be as pissed as our audience a few hours later. We had an excellent lunch, nonetheless, joined as we were by a man I shared a bedroom with from 1982 to 1989, which is exactly the sort of thing that people who went to boarding school think is normal, which is why most other people find it so weird. I would write a review, but having discovered they have a second, more restaurant-y venue in Queen’s Square, I’ll save that for another day. Added to which, Corkage was recommended by another old London mate who has put up with me blogging our lunch innumerable times, now lives in Bath, and had booked Noya’s Kitchen on the Saturday. Philippa has excellent taste in many things, (including friends, obviously,) and as I walked into the restaurant with its impeccable colour scheme it looked as if she had done it again, were it not for the fact they couldn’t find our reservation. It is testament to the lightness of touch about the whole place that they made this very much their problem, not ours, and a perfect little corner table was found immediately. I really don’t have a great deal to say about the food other than it was more perfect than the décor, the table and the service. This place is superb. Everything you could possibly want from Vietnamese cuisine, with the possible exception of a pho, which was sadly absent from the menu on this occasion. The food had all those wonderful combinations of sweet, sour, hot and salty, brilliantly realized in every dish. There is not an extensive menu, but as I get older, I’m beginning to appreciate that more. I think it’s an Italian tradition that you turn up at a restaurant and they give you what they’ve got, and I’m coming round to the idea. When you live in a society that (erroneously) fetishizes choice, being told what to have is something of a relief. We shared three starters – delicate but hearty prawn summer rolls, which would have been outstanding on any menu, but here fell slightly behind some gloriously sticky corn & sweet potato fritters, given a pleasing crunch from their iceberg lettuce leaf platters. Pork dumplings were even better. Unctuous filling and crispy pastry finished off with generous globs of a chilli concoction that was the refreshing assault on the tastebuds December cries out for, even if we were in downtown Bath, not Saigon. Mains were, by this time, predictably wonderful. Phil’s chicken stew had all the warmth of proper comfort food with the almost medicinal tones of ginger running through it, while my pork with vermicelli noodles was simply astonishing. Literally every gastropub that sticks porkbelly on its menu, as if it cooking it is simplicity itself, needs to come to Noya’s (they have a cookery school,) to learn how to do it properly. Everyone talks about meat ‘falling apart’ but getting it to stick together at the same time is quite a feat. I could have eaten another plate of just the pork itself given the opportunity, but would have hated to do without the beansprouts, red onion, peanut, and oh, all those Vietnamesey things, all covered with a radish infused sauce that was half dipping, half porky smokey stock. One of the glories of Asian cuisine, at least to a Western palate, is not usually dessert, which may explain why Phil simply went for a Vietnamese coffee. I am, nonetheless, always prepared to give things a try, and, like the martyr I am, availed myself of a quite outstanding chocolate brownie with mango ice cream. A dry brownie is a sad, sad thing, but this was extremely happy, the richness of the sticky chocolate perfectly complimented by the mango. We washed everything down with a Kiwi Riesling/Sauvignon Stump Jump, which was the ideal accompaniment to those bold Noya flavors and is highly unlikely to be served at any comedy club Christmas parties. At £65 (without service) this was also a (very) fair price for a delightful meal. I would love to come back in the evening, as they also do supper clubs, tasting menus and all that jazz. To be fair, I would have jumped at the chance to go back that night, but I had to join forces with Mark and Laura to do battle with a table of army driving instructors dressed as Peaky Blinders – honestly, sometimes the jokes don’t so much write themselves as turn up in fancy dress. Luckily I was on first, had what seemed to be the best of them and then jumped on a train full of far worse people than I had left behind. Luckily, almost all of them got off at Swindon, where I will not be appearing in panto this season, and I was able to reflect on three lovely days, some excellent company and two wonderful meals only interrupted briefly by, well, you know…Christmas. There is so much to love about America, and I think we have to add American waiters to the list. As long as you can stifle the giggle reflex, their desire to accommodate your every whim, whilst exuding Moonie-ish levels of happiness and bonhomie AND making you feel like you have ordered better than anyone else ever in the history of restaurants can make for a truly heartening dining experience. I *know* no one can read a menu like I can Chris, but *thank you* for saying so. Now please stop beaming for a second because at this rate your face will be killing you by last orders. I had never been to Boston before, and it is a sturdy, square-jawed kind of a city. One of America’s insecurities is its youth as a nation, but if there is a state that can claim some serious lineage it is Massachusetts and the surrounding area. Settlers first arrived nearly four hundred years ago and probably found themselves as welcome by the local inhabitants as they would under the present regime. Plus ça change. We walked the Freedom Trail, and attempted to go for dinner in the Union Oyster House, but a wait of over an hour was too long for us, especially with a little one it tow, even if it is the oldest restaurant in America. There is, admittedly, a lot of this about in Boston, including a number of the oldest pubs in America within spitting distance which gave the whole place a slightly disconcerting similarity to central Nottingham. Finding ourselves in the Italian Quarter, we essentially took pot luck with Aqua Pazza, which the door plaque informed us was ‘a Frank DePasquale concept’, and as it turns out, Frank knows his concepts. Despite a relatively busy marble cocktail bar, a raw bar, shiny glassware and softened lighting of the sort you find in a place where deals are done and assignations, er, assignated, they found us a high chair and made a little family of Brits feel hugely welcome. My daughter even got crayons to eat, which is always a bonus. Chris, our beloved waiter, would indeed have been mocked by a puppy for his wide-eyed eagerness, but I say this in admiration, not admonition. When you can report back from the kitchen that a certain item can be cooked ‘without removing from the dexterity of the dish’ while keeping a straight face, you have my vote, not to say my undivided attention while I try and work out what the hell you’re talking about. 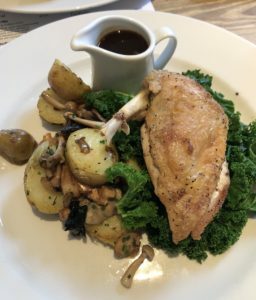 There is an excellent selection of seafood and Italian accented specials and we ordered fairly simply and quickly – parenthood does tend to mean the luxury of languorous dining is a thing of the past these days. There was some excellent sourdough, which I’m pretty sure Chris took commission on as he kept on bringing it as fast as I could shovel it into my mouth. This was probably a good thing, as the portion sizes were not extravagant, but I’m happy to report the flavours were. My starter of tuna crudo – flash seared fish with a green curry paste and enough chilli to give it proper attitude – was a refreshing thing of beauty, while my wife’s tartare of the same fish was a similar delight for the taste buds but with the added texture of a natty little wonton cannoli. 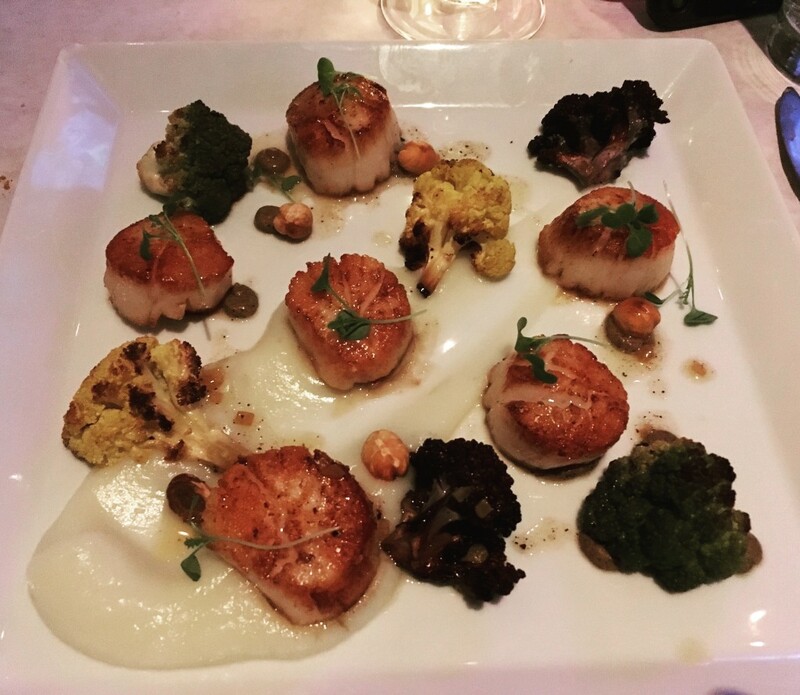 Scallops with cauliflower is boring, so I ordered it to see how good the kitchen was. I can cheerfully report the reason this is a classic combination is that it tastes like one, and this was simply the best version I have ever eaten. While portion size in terms of extras may not have been excessive, I’m pretty sure six actual scallops is a pretty good return on a $30 investment and they were cooked to perfection. This was a nutty, brassicy, buttery kind of a dish, with a lot of caramelisation going on. I loved it ever so slightly more than my wife’s lobster roll, which although beautifully indulgent, was still a sandwich, so I won. I should add that the roll came with truffle crisps, which were so good I’m starting a campaign to have them installed as the only crisp flavour allowed from now on. All this was washed down with a ‘frizzante’ (someone’s been Googling) glass of Vermentino which Chris said was ‘possibly his favourite wine ever to go with seafood’. I avoided the temptation to ask him if there was anything he didn’t like, mainly because it really was absolutely bloody lovely. We should have had dessert, but it was a Friday night, and the restaurant was obviously hotting up for the kind of weekend service that I would be delighted to take my wife to if we hadn’t got a small attention-seeking missile launcher with us. It also allowed us the luxury of leaving an American restaurant without the feeling we were about to burst from conspicuous consumption, which is genuinely the only time this happened in an entire holiday. It wasn’t cheap, but food this good shouldn’t be, and anyway, someone was going to have to pay for Chris’s therapy and the surgery required to return his face to its natural state. We sauntered off into the night, utterly replete, and were able to return to Boston a few days later and grab an afternoon plate of some of the best oysters I’ve ever had at the Union Oyster House. 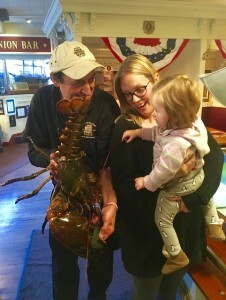 Service was once again impeccable, and even included a lovely man who brought out a lobster the actual size of my daughter to take photos with her. Twice. It may be a tourist hotspot with plaques all over the place listing all the famous people who’ve been there, but there is a reason for that. People want to go there. And I want to go back. I also want to go back to Aquapazza. And Boston. And America. But I would prefer it if they made Chris President. In these times of heightened sensitivity in the gender wars, it’s probably not a brilliant idea to admit to a little light stalking. Still, at least I’m fessing up, so American conservatives can rest easy I’m unlikely to take my place on the Supreme Court any time soon. The unfortunate recipient of my attentions is the food writer Marina O’Loughlin, who I’ve never actually met, but with whom I like to think I have struck up some sort of relationship via social media, which is exactly the sort of thing a stalker would say. In a very crowded market place, she is undoubtedly the wisest and funniest commentator on the modern restaurant scene in the UK, which is obviously the main reason The Sunday Times poached her from The Guardian and why I therefore had to swallow my anti-Rupert principles and sign up to breach their firewall for my designated two free articles a week. To get my own back I only read one. Knowing from my own extensive research (/more stalking,) that Marina hails from Glasgow originally and finding myself there for a long weekend at the excellent Stand Comedy Club, I dropped her a line and was rewarded with a couple of recommendations, which has done nothing to diminish my nerdy fanboy status. Glasgow is such a handsome city. Of course there are parts you wouldn’t want to walk down on a dark night, but there is a reason that Washington DC nicked the template. I walked down Argyll St, bang into the Kelvingrove Art Gallery, just sat around a corner being all magnificent, on my way to The Partick Duck Club. This must be one of the most wonderfully named restaurants I have ever visited, and they explain all about it on their website so I won’t bore you with it here. The food was anything but boring. Do you remember when cauliflower used to be crap? Overcooked, pale and flaccid or just buried in cheese sauce to make it acceptable? Don’t get me wrong, a good cauliflower cheese is a thing of beauty, but I remember the first time I roasted some in the oven just for the hell of it and suddenly found out it was my favourite vegetable. A bit of chilli and oil and char and hey-presto! That’s exactly what they did here but better with a little crème fraiche, micro herbs and spiced nuts to accentuate the already nutty tones. Simple perfection. I followed it with the duck leg as I felt I had to. Some might say the addition of duck fat fries and a crispy duck egg into which to dip them might have been slightly overdoing it, ducky. I would simply refer them to the name of the bloody restaurant. Not only was this a glorious celebration of a wonderful ingredient, it was lifted to another level by the addition of a pineapple chutney which cut perfectly through the fattier notes and found me in the not unfamiliar position of licking the plate. All this was washed down with a very decent ale I’ve forgotten the name of and meant I had to have a pear frangipane tart with candied orange crème because…well, because. I could not fault the food, and service was so exemplary that when I dropped a piece of cutlery a waiter came running over with a new fork, not because he’d seen me do it, but because ‘it sounded like a fork’. All this and coffee for just under £40 (excl service) seemed like a steal – O’Loughlin was clearly on fire. 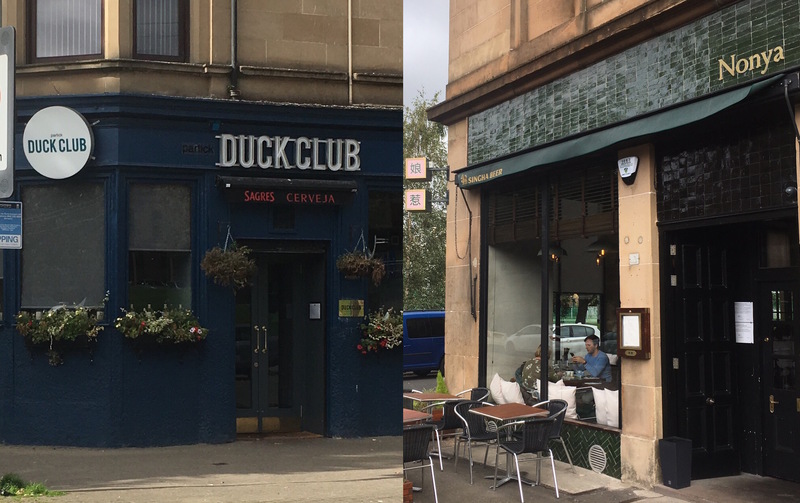 Nonya is a rather different proposition – just around the corner and further proof of why the West End is becoming one of Glasgow’s hottest areas if you want to eat well or punch a hipster (the two often go hand in hand.) While the Duck Club is an all day affair, and still retains a charming pubbiness, Nonya is a little more restauranty, but no less welcoming for all that. It looks like a restaurant – stylishly designed, comfortable without being imposing. And there is some seriously good stuff coming out of the kitchen via South East Asia. Laab spiced chicken heart skewers with a little five spice on the side were exquisite. They were on the menu as bar snacks, which should make your average peanut cower in shame. There were peanuts on the menu too, but they were soy braised with celery and spring onion, so I imagine they held their heads up high. I didn’t bother with them as I was getting a bit carried away further down the menu with a spinach and bamboo dumpling that now holds the prize for the nicest dumpling I have ever eaten – crunchy on the outside, gelationous and beautifully flavoured within, with a jumpy little dipping sauce to hold the whole thing together. 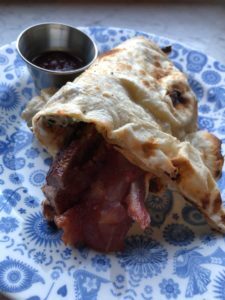 A curried venison roti was still listed as a bar snack, but was anything but – the meat and slightly oily, crunchy roti freshened with a chilli, red onion, cucumber and coriander salad that was like being slapped about the chops in a friendly way. This trick was also pulled off by a (very generous portion of) flash-fried onglet from the Small Plates section of the menu, from whence I also ordered a pork belly, aubergine and black bean hot pot that was more a cuddle than a slap, and all the better for it. I stopped at this point because the walk back to my hotel was really not long enough to work much of this off. This is not the kind of stalking that does much for the waistline. Clearly you can take the journalist out of Glasgow, but you can’t take Glasgow out of the journalist. It continues to be a favourite city of mine for any number of reasons, and now I have a couple more. Not only that, I also retain a healthy (I hope) appreciation for the talents of one of Mr Murdoch’s finest employees, whom I’m very much hoping will regard this blog as the compliment it is intended to be rather than a cause to apply for some sort of injunction. Well I wasn’t even going to blog it, but as I now find myself with four hours to kill in Oslo airport having just spent £18 on an unexceptional burrito and a bottle of water, I need something to occupy myself, and writing about Estonian cuisine just seems the obvious choice to distract myself from bankruptcy. I was delighted to find myself back in Tallinn at the Komeediklubi (sorry, fluent Estonian, don’t like to show off,) working for my good friend Andrus Purde. I was even more pleased to find I was travelling with Nick Doody, an exceptional comic and thoroughly good egg whom I have known for nearly twenty years. The only problem was the fact our flight had been at 7am, it was lunchtime, -10 and we really wanted to eat. We took a wander around the Old Town and eventually plumped for Farm, mainly because the menu looked good, and only partly to avoid a man who was asking Nick for money. Once inside I knew we had hit some kind of jackpot simply by virtue of the utterly baffling display of stuffed animals playing cards in the lobby, as though some ambitious Estonian taxidermist had seen one of those old pictures of dogs playing snooker and really decided to up the ante. I always love it when the guardian of a conspicuously empty restaurant asks if you have a reservation, and then makes quite a play of checking the bookings when it is abundantly clear they could happily sit you at one of about fifty tables, but this was a fairly short-lived amusement, and we were soon shown to a large table near an open, glass-walled kitchen. I wasn’t wild about the décor – it looked as though a department store designer had been handed a brief marked ‘rustic’– but it was neat, tidy and clearly designed to appeal to tourists, which was handy, as that’s essentially what we were. And I have to say it did appeal, hugely. The menu was a fascinating collection of game, fish, berries, herbs and the heartiness of Eastern European cooking with a Baltic influence. By which I mean there was potentially a lot of sour cream about. There was even a decent vegetarian option of mushroom cutlets, even if I could tell their heart wasn’t really in it. It wasn’t cheap either, with most main courses starting around the teens upwards, and one does tend to get a lot less for one’s Euro these days, so we opted to have mains only. But first we were brought Estonian black bread, baked in house and not something I thought I always appreciated. As I said to Nick, if it looked like cake, it should bloody well taste like cake. Our charming waitress informed us it was best enjoyed with butter and a few flakes of sea salt, although, as Nick pointed out, everything tastes better with butter and a few flakes of sea salt. What I was not expecting was for it to genuinely taste like cake, and really good cake at that. This was helped along merrily with a couple of glasses of local beer – a pilsener for Nick and a ‘red’ beer for me which was a delicious, full bodied challenge to order a second, which we nobly refused to do because, you know, professionalism. When the mains arrived, possibly my only criticism was the portions were slightly less hearty than the ingredients, but my grilled ox heart with potato and roasted garlic cream was a tender, meaty delight, nicely enlivened by a few smears of juniper and some perfectly cooked yellow beets and green beans. The only slight misstep was a quenelle of tarragon butter that I didn’t think really qualified as a sauce, but then the dish didn’t really need it, and besides, it went very well on a second order of bread. Nick pronounced his pike fillet excellent, if a little bony, but then that is rather like attempting to leave the EU, then finding it was a little more complicated than living up to a slogan on the side of a bus. It is par for the course. We decide to call it a day at that point despite being mildly tempted by a selection of dairy based desserts that I’m sure would have cleansed our palates admirably. The bill came to €45, including exemplary service, and with this level of cooking really resembled something of a bargain. There is an element of the tourist trap to the place, with its in-house bakery and adjoining café on site, but then if you’re going to trap me somewhere, feed me excellent beer, bread and intriguing flavour combinations while I natter away to an old friend, you are unlikely to find me complaining. We walked back out of the front door to discover three stuffed owls sitting on a grand piano that thankfully no one had started playing while we ate, and I wrote something complimentary in the guest book while our coats were retrieved. 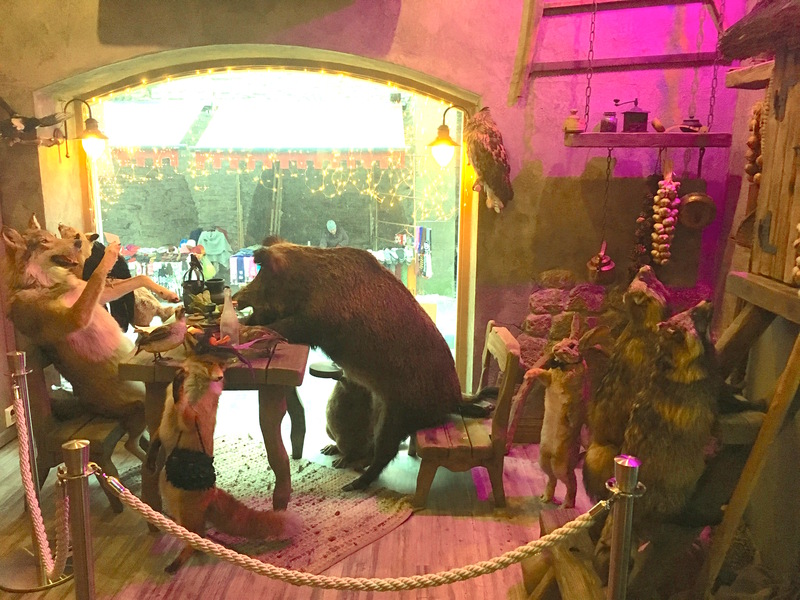 I fully intend to return to Farm next time I’m in Tallin, where I very much look forward to enjoying Estonian gastronomy again, if not, possibly, the taxidermy that may well make some of it possible.